Harold Bryant Williams, Sr., 85, of Norristown, PA, passed away on November 11, 2018. He was he beloved husband of Wilma (White) Williams. Harold was born in Newberry, SC on June 1, 1933 to the late Oscar and Lula (Keyton) Williams. He served his country with the U.S. Army during the Korean War. Harold was employed with Phoenix Steel for over 33 years and later with Lukens and Bethlehem Steel for 10 years. Harold was a hard working man who never complained nor took a day off from work. He also enjoyed carpentry which he taught himself. Along with his wife, he is survived by his four children: Venesia Johnson (Chester), Harold Williams (LaMar), Selina Jones (Kevin), Wilhelmina Clarke (Elijah); 10 grandchildren; 10 great-grandchildren. He was predeceased by7 siblings: James Williams, Thomasena Reuben, Ethel Foggy, Addie Crump, Bernie Stone, Oscar Williams and Wilhelmina Groves. Relatives and friends are invited to his Funeral Service on Monday, November 19, 2018 at 11 AM at the Emil J. Ciavarelli Family Funeral Home and Crematory, 951 E. Butler Pike, Ambler, PA 19002. A viewing will be from 9 AM to 11 AM at the Funeral Home. Interment will be in George Washington Memorial Park, Plymouth Meeting, PA. Condolences may be made at www.ciavarellifuneralhomes.com. To send flowers or a remembrance gift to the family of Harold Bryant Williams, please visit our Tribute Store. 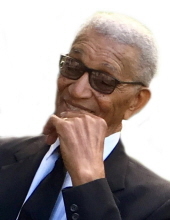 "Email Address" would like to share the life celebration of Harold Bryant Williams. Click on the "link" to go to share a favorite memory or leave a condolence message for the family.